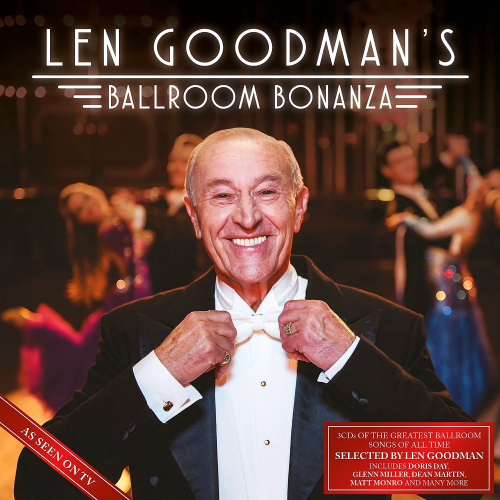 ‘Len Goodman’s Ballroom Bonanza’ 3-disc album, is a sparkling collection of the greatest ballroom dancing songs of all time, hand selected by Len Goodman and includes tracks from Doris Day, Tony Bennett, Billy Joel, Dolly Parton and many more. Shimmied together with beautiful packaging, Len has created the perfect gift for Christmas and is set to hit the cha cha chart! Len Goodman is the Head Judge on Strictly Come Dancing in the UK and Dancing with the Stars in America. His vast knowledge of ballroom and Latin American dancing has been gained over a lifetime of competing, judging and teaching all over the world. Len has made numerous TV appearances including Titanic with Len Goodman, Len Goodman's Dancing Feet, Who Do You Think You Are, Good Morning America and Larry King Live.